Inside Job DVD Review Engrossing and disturbing in equal measure, Inside Job is a stunningly crafted and thoroughly compelling film from start to finish. 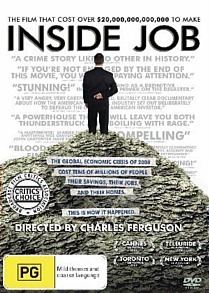 Winner of this year’s Academy Award for Best Documentary Feature, Inside Job chronicles the origins and repercussions of the 2007-2010 global financial crisis, which through a combination of systemic corruption, deregulation and mismanagement within the banking industry cost tens of millions of people worldwide their jobs, live savings and even their homes. The story of how it all went wrong is split into five chapters – How We Got Here, The Bubble (2001-2007), The Crisis, Accountability and Where We Are Now – and begins in Iceland over a decade ago. That country had, until 2000, experienced such a golden period of economic growth as was almost without parallel in history. That is, until country’s banks become privatised and their investment and borrowing activities became largely deregulated. With losses eventually exceeding $100 billion (against a gross domestic product of $13 billion), housing prices having more than doubled and bonuses paid to industry’s executives frequently in the tens of millions of dollars, Iceland’s three largest banks finally went under. Unemployment tripled and many people lost everything they owned. Over the next few years the exact same pattern played out in the United States, where the financial sector was and is dominated by a few gigantic firms such as Merrill Lynch, Goldman Sachs, Citibank and AIG. Inside Job paints the GFC as entirely avoidable, the consequence of several decades of deregulation and corruption within the banking industry. And that’s where it starts to get complicated, and a crooked and thorny tale involving subprime loans, derivatives, sham credit ratings, onselling of mortgages, predatory lending and intentional deceit on the part of the banks begins. This is heady stuff for those with a minimal (or in my case non-existent) knowledge of economics and the global financial markets, but thankfully filmmaker Charles H. Ferguson has factored this into his presentation, seamlessly incorporating numerous animated graphs and diagrams in an attempt to make the relevant changes in policy and banking practises comprehensible and relatable. And it works. Engrossing and disturbing in equal measure, Inside Job is a stunningly crafted and thoroughly compelling film from start to finish. Narrated by Matt Damon and expertly directed by Ferguson (this is only his second feature, the first being the highly lauded No End in Sight: Iraq’s Descent into Chaos), it’s a fascinating account of unrelenting greed and even more unrelenting fiscal mismanagement, the billion dollar bailouts required to steady the ship and the repercussions of the crisis, as well as the present status of the men who provoked it (yes they are almost all men, and yes they all managed to hang onto their fortunes). Through a riveting and seamless blend of interviews, courtroom footage, letters and documentation, investigation and elucidation, Inside Job offers a rich and occasionally indignant insight into a trillion dollar world of corruption. Guaranteed to make your blood boil, laden with first rate extras (including a rollicking and highly enjoyable audio commentary) and absolutely not to be missed.